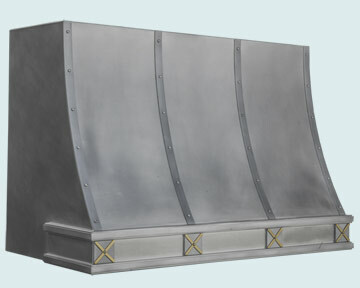 Handcrafted Metal makes pewter Sweep Front range hoods that are customized to accommodate your kitchen and your taste. Sweep Front range hoods add a touch of Early Modern style to any kitchen. The single geometric curve and sleek texture set the strong Art Deco look, and the flat ends let this hood completely fill the the space between cabinets. You can also make these hoods reach up to a tall ceiling by stretching the hood or by adding a stack. With us you can customize every dimension and feature, such as hammering, color tone, and lighting. To further customize your pewter range hood you can also choose from additional features, such as elegant bottom bands, hand-wrought straps, clavos, and rivets. Personalized features like these are guaranteed to please. Our pewter range hoods are made with the purest pewter available, and are very durable. We will work with you to make a superior pewter hood that looks splendid in your kitchen. Click on any Single Roll hood below to see more pictures, and customize it according to your specifications! This custom pewter hood is made from the purest pewter available. It features antiqued zinc straps on the front with matching rivet fasteners. It also has a stepped & recessed bottom band, with zinc straps framing the top & bottom steps. Along the center of the band are zinc tiles with a brass applique "X" & brass rivet fasteners. The entire hood is smooth, & has a natural matte finish.